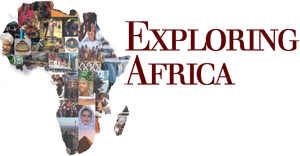 It is difficult in the United States to find intelligent and informative news sources on Africa. Occasionally an article will appear in a newspaper, magazine, or television news program to inform Americans about a crisis in Africa such as famine or armed conflict. But these articles rarely take the time to explain the social and historical context in which these crises arise. And very little is ever reported on positive developments in Africa. Furthermore, Americans in general remain poorly informed about the cultures and politics of Africa. They often rely on popular stereotypes of the continent to try to explain why certain crisis may be happening instead of trying to understand that situation in depth. These reports draw on “tribalism” as a prominent factor in African wars, without discussing the deeper history of the armed conflicts. First of all, tribalism is a term that is improperly applied in most cases to African societies. A tribe is a form of social organization far less complex than what actually exists on most of the African continent today. And it often has negative connotations of being savage, ignorant, or uncivilized. This is a negative stereotype of Africa that we are challenging in this curriculum. Furthermore, ethnic divisions that have arisen between fighting factions in Africa can be understood in large part historically as part of global, political and economic relations. This will become clear in the case study below on Liberia. As we all know, stereotypes may have a little truth in them, but they are oversimplifications and generalizations of reality. For example, there are areas of the African continent where there is currently a high degree of violence and insecurity (i.e. Liberia, Sierra Leone, Democratic Republic of Congo, Cote d’Ivoire, Zimbabwe, etc. ), but there are also many more areas where it is generally quite safe to live. What we want to start doing in this activity is to help you identify stereotypes about Africa when you see them and begin to ask intelligent questions about current events in Africa that you read about. We also want to encourage you to look at multiple news sources when gathering information about an issue in Africa. When looking at these news sources, what can you do to try to read news reports critically and gather good information on current events in Africa? Take a minute to brainstorm and write down several strategies you would take to answer this question. We are now going to look at specific case studies that deal with current events in West Africa. The first is in Liberia. As you read through the brief history of the conflict below, begin to think about how you can try to understand conflict, violence, and warfare in Africa in a more complex and mature way than some of the popular stereotypes we discussed above. The second case study highlights more positive current events that often do not get reported in the media. This section discusses some of the successes of Cabo Verde, which has enjoyed considerable peace, democracy, and a decent standard of living compared to other West African countries. As this module on West Africa is being written, there is a resurge of violence in the country of Liberia. The reasons for it are complex, yet taking a look at how the history of the region is connected with what is happening today will help us to better understand it. Without the history of how power and oppression emerged in this region, one might be quick to draw on stereotypes of Africa to explain the war. For example, someone might say simply that African governments are corrupt or that war is a part of tribal cultures in Africa. But let’s take a closer look at whose hands were actually in the formation of Liberia and the escalating violence there. Liberia was originally created as a country by freed Black slaves sent there from America in the early 1800’s. These former slaves became a ruling elite constituting about 5% of the population. The rest of the Liberian population is indigenous to the region, and they ended up being oppressed by the new ruling elite. Resentment grew over the years towards this ruling elite. For more detail on the history of the formation of Liberia as a country, see Module 15: Activity 6: The Return to Sierra Leone and Liberia. In 1980, a coup d’etat led by Samuel Doe ousted the former regime and installed his own. But he too marginalized the majority of the population politically by installing primarily people from his own ethnic group into the government. The ability of Doe’s regime to stay in power is due at least in part to support from the United States of America. This was a part of the US Cold War policy. The US gave aid to Liberia out of fear that they would otherwise side with Libya or the USSR. Doe actually personally received 66% of the aid, rather than the US government giving it to the country as a whole. With these resources, he remained in power largely by terrorizing his own people. This enhanced ethnic divisions in Liberia since much of the violence carried out was targeted at certain ethnic groups. In 1988, just before Doe was ousted from power in a coup d’etat, the US cut off aid to Liberia. Since coming to power, Taylor’s opponents have begun the next wave of fighting in Liberia. The most prominent among these rebel groups are the Liberians United for Reconciliation and Democracy (LURD) and the Movement for Democracy in Liberia (MODEL). Taylor’s regime has been accused of serious human rights violations, controlling the media in Liberia, and supporting the civil war in Sierra Leone. In June 2003, Taylor was indicted for war crimes in the 10-year civil war in Sierra Leone. This launched a new surge of violence in Liberia again. Africa has for a long time been a “playing field” of European and American economic and political interests. We see in the example of Liberia how the US established Liberia as a place to send repatriated slaves. This exploitation of African peoples as slaves and then disruption of the local scene in Liberia as they were sent back as a ruling elite was the source of an imbalanced power dynamic that divided people in Liberia according to ethnicity. The US support of another corrupt regime—Samuel Doe’s—exasperated further ethnic divisions. Furthermore, the wars in Liberia and Sierra Leone were largely funding by warring factions selling precious natural resources for weapons on the world market. 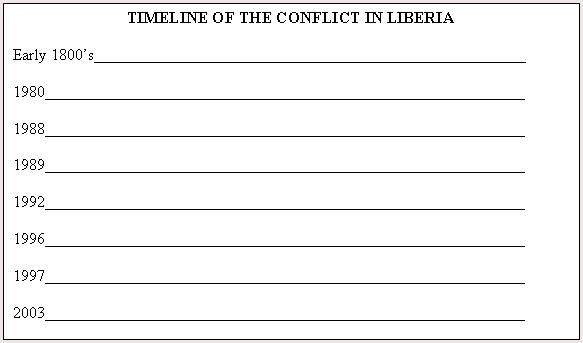 Now based on what you have just read about Liberia, fill in the timeline below with significant events for each date. 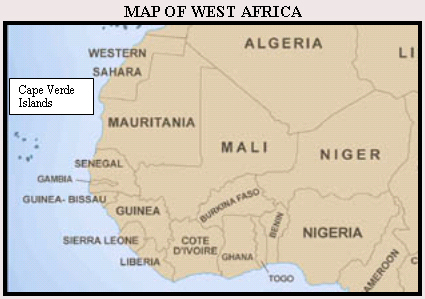 The Cabo Verde Islands are located off the shore of Senegal and Mauritania (See Map of West Africa below). These islands were uninhabited until Portuguese started settling there around 1492 CE, bringing Africans to work as slaves on their plantations. The islands soon became an important stop in Atlantic trade networks, especially for slaves. Cabo Verde remained a Portuguese colony until 1975, when it gained independence. This section focuses on recent and positive developments in Cabo Verde since independence. Cabo Verde stands out in many ways as a West African country that has made important steps toward peace, democracy, and improved quality of life for its citizens. Cabo Verde is a country that has avoided the types of violent conflicts that countries like Côte d’Ivoire, Liberia, and a number of other African countries have suffered from over the last several decades. In general, it has maintained a low degree of militarization in its society and has developed a nonviolent political culture for dealing with conflict. At present, two major political parties have developed in Cabo Verde—the PAICV (African Party for the Independence of Cabo Verde) and MPD (Movement for Democracy). Each of these parties has been elected to power for various periods of time, thus maintaining civilian rule since independence without interruptions from military regimes or coup d’etats. What is the quality of life for people in Cabo Verde? And how do we go about assessing this? The United Nations is one organization that has gathered data on countries around the world in order to give an overall picture of the quality of life in each country. Some of the data that the UN has gathered on Cabo Verde is listed in the charts below. It uses indicators such as under-5 mortality rate, GNP per capita, and adult literacy to give some indication of the quality of life in a country. There are two things to be careful of, however, in reading this kind of data. First, remember that these are only averages or generalizations of people in a country. We all know that a country can have extremes within it of wealth and poverty, health and disease, literacy and illiteracy, etc. So keep in mind that there will be people in every country of the world who live at various ends of the spectrum. For example, if the GNP (Gross National Product) per capita of a country is US$1000, this does not mean that every person in the country earns $1000. Rather, there will be some people who earn about that much, some people who earn more, and some people who earn less. The number $1000 is just an overall average. The second thing to be careful about when reading this data is that these are selected indicators of quality of life, which are not completely comprehensive. That is, they tell us a little bit about life in a country, but there are many more things that the data do not tell us. For example, knowing the GNP of a country is US$1000 per capita does not give us any information on how income is divided up by gender. Do men overall make more money than women in that country? If so, why does this occur? Neither does GNP tell us if this amount of money is enough for a person to buy the things needed for day-to-day life. Prices of food, housing, and transportation are different throughout the world. For example, $1000 a year is not enough for a person in the US to live on because of the high cost of living. But it is adequate in some countries of the world where food, housing, and transportation are cheaper. Thus, keep in mind that these kinds of questions cannot be answered with the data given of only GNP. Take a look at the data below from the United Nations Children’s Fund (UNICEF) on CaboVerde Islands and answer the questions that follow. * Probability of dying between birth and exactly 5 years of age expressed per 1,000 live births. ** Gross national product (GNP) is the sum of gross value added by all resident producers, plus any taxes that are not included in the valuation of output, plus net receipts of primary income from non-resident sources. GNP per capita is the gross national product, converted to United States dollars using the World Bank Atlas method, divided by the mid-year population. ***Percentage of persons aged 15 and over who can read and write. 1. How is the GNP per capita calculated? 2. What percentage of the population over 15 years old is literate? 3. Out of 1,000 live births in Cabo Verde, how many of those babies will die before turning 5 years old? 1. Is Cabo Verde’s GNP per capita more or less than the GNP per capita for Sub-Saharan Africa as a whole? 2. Whose literacy rate is higher—Cabo Verde’s or the United States’? 3. What is the Under 5 Mortality Rate for Sub-Saharan Africa as a whole? This data can give us some idea that Cabo Verde is doing better in terms of literacy, infant mortality rate, and GNP per capita than many other sub-Saharan African countries. It also shows us that Cabo Verde still lags behind the US as far as these three indicators go. We have already mentioned the important issue of determining what a data set does and does not tell us about a population. The data above is for countries or regions as a whole, but it does not indicate distinctions within those countries or regions. Here is a different data set that does give some indication of differences within a country between men and women who are literate. Read the information in the chart and answer the questions below. 1. Out of a sample of 100 women over age 15 in Cabo Verde, approximately how many of them will know how to read and write? 2. Which country has a more equitable rate of adult literacy between men and women? 3. The data above has given more specific information on the literate population of Cabo Verde and South Africa than a mere percentage of the total population by breaking the population into two categories—men and women. This has given you some indication that in Cabo Verde, more men than women are literate. What other categories would be helpful for you to know and compare regarding the population of literate people in Cabo Verde? Again, it is important to keep in mind that charts and statistics like these give some idea of general trends in a country, but they are limiting in the information that they really tell us. Summarize in several sentences what you have learned about Cabo Verde from the data in the above charts. Activity One: What is West Africa?